There were not many choices close to our venue that were willing to perform our interfaith ceremony. Feeling a little discouraged, I broadened my search to all types of Judaism including Reform, which led me to Rabbi Marc Ekstrand of Temple Emanu-el. Our 15 minute phone conversation was all I needed to know he was a perfect fit. He asked us if we would be willing to meet 4-5 times as sort of premarital counseling and to further discuss the vision for our wedding. With each meeting we discussed the relationship between Colin and I, the vision for our interfaith ceremony, our future as a couple of two faiths, and our shared humanist values on being a kind person first and foremost. We are so excited to not only have Rabbi Ekstrand to co-officiate our special day but as a support system throughout our journey as a married couple of two faiths. 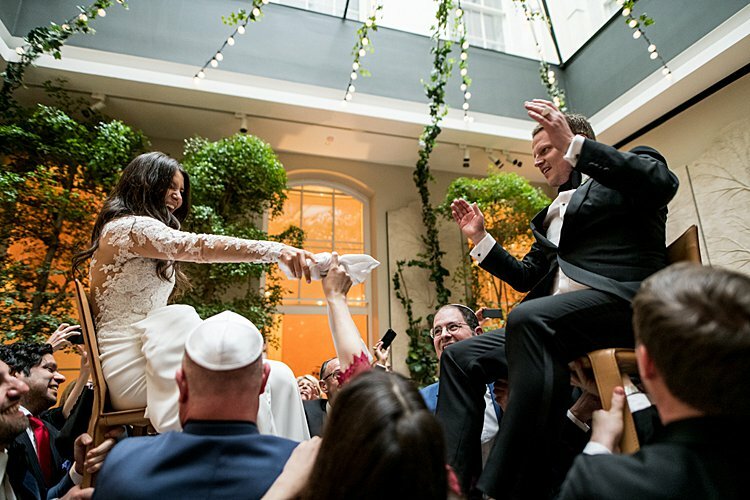 Choosing the officiant on the Catholic side was a much simpler task. My parents had recently attended a wedding and were raving about our family friend Paul Uccello who was the officiant. They carried on and on about how eloquent and touching the ceremony was. Paul is a chaplain who has a background in interfaith relationships, which made it feel almost destined to be. We all met for dinner at my parents where we discussed our relationship, our future goals, and what we envision for our wedding. Paul has such a warm and caring essence that resembles Rabbi Ekstrand that we knew they would work well together. We know that the pair will seamlessly combine our two faiths into the perfect ceremony for us. 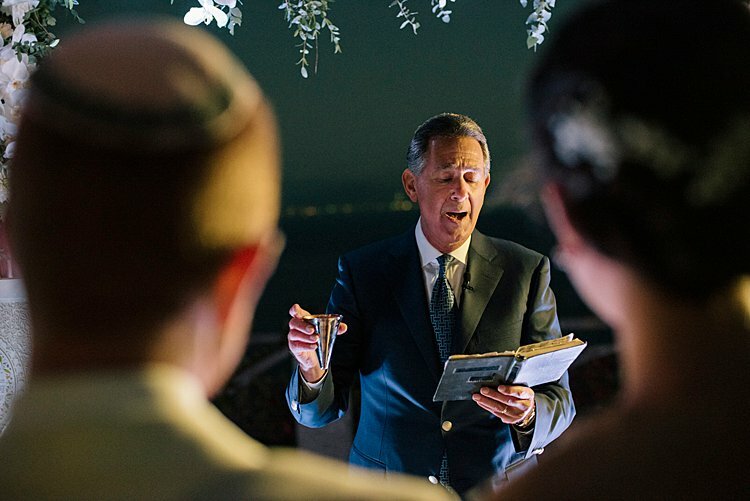 Rabbi Ekstrand had suggested I read the book, The Jewish Wedding by Anita Diamant to get a better sense of a typical Jewish wedding and to determine what traditions were important to include in ours. He warned me ahead of time that the book was a little “old school” but that we could modernize many of the traditions we wanted to incorporate. 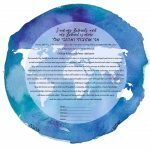 One element we always knew we wanted to do was sign a ketubah. The book talked about the difference between traditional ketubahs and modern ketubahs. 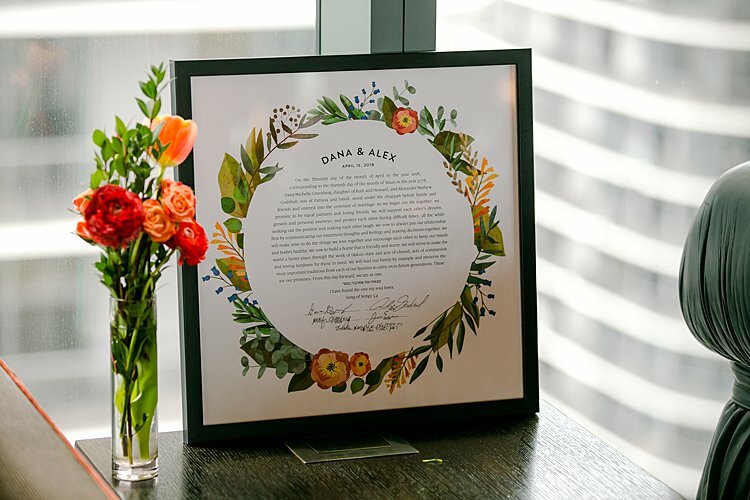 Personally for us, a modern ketubah was the only way to go. We wanted it to feel less like a contract and more like unified vows. We found the company Ink With Intent to not only have the most beautifully designed ketubahs, but a wide variety of pre-written texts for any type of Judaism, as well as Secular and Interfaith. We decided that the Secular text best represented us as individuals and us as a couple. Colin and I are not the most confident public speakers, thus will not be writing or reciting our vows aloud, so when the Rabbi suggested he read our ketubah during the ceremony, we thought it would be the perfect opportunity for our guests to hear our commitments to each other. Colin and I toured a couple of venues prior to selecting Latitude 41. One of the first venues we looked at was setting up for a Jewish wedding while we were viewing the space. 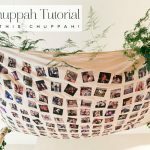 Colin and I were in awe, not only of the beautiful atmosphere they had created but of the gorgeous chuppah at the center of it all. We congratulated the family and shared how beautiful the chuppah looked as the focal point in the space. The father of the bride then proceeded to tell us how he had handcrafted the chuppah as a gift for his daughter to cherish for years to come. I couldn’t get over the sweet sentiment and of course gushed about it to my mother. My mom then shared the story with my dad who also could not get over the emotional gesture. My dad thought it would be even more nostalgic for our chuppah if he built the structure with birch trees from the yards of both Colin and I’s childhood homes. My dad went to Colin’s dad for guidance and he too loved the idea. He even brought back trees to incorporate from their vacation home in Vermont. After researching many different chuppah structures my dad, brother, and soon-to-be father in-law all built the “home” we will stand under to begin our married lives together. The tradition of the Seven Blessings or Sheva Brachot was something I was not aware of prior to meeting with our Rabbi. This tradition was something that Colin and I agreed would be nice to include during the ceremony. When reading through each blessing our Rabbi pointed out the harsh tone of the word “barrenness” in the blessing regarding children. Colin and I have talked about having children and both aspire to be parents, yet the future is unpredictable, and we personally found the word to be a little insensitive. Our Rabbi presented us with a reworded blessing that we felt much more comfortable with. Additionally, our Rabbi suggested having the blessings read in both Hebrew and English as a way to highlight our two faiths and incorporate our chaplain Paul. I think it is a sweet touch that will make for a beautiful way to blend both faiths together. One of my favorite parts of a Jewish wedding is when the groom smashes the glass and all the guests shout “Mazel Tov!” It is such a celebratory moment filled with joy and love. We are especially excited to use our Smashing The Glass pouch gifted to us by Karen! A special memento to remember my time as a blogging bride-to-be! Directly following the ceremony Colin and I will take part in Yichud, where we will take a few minutes to be alone just the two of us. Every person who has offered me any bridal wisdom has reminded me to stay present on the day. They all have advised me to soak up every moment because it goes by in the blink of an eye. One way I can force myself to do so is through the tradition of Yichud. I am hoping years later we can look back on that moment and remind ourselves how truly amazing our wedding was and how wonderful it felt to finally be married. Another one of my favorite Jewish traditions is the Hora dance during the reception. 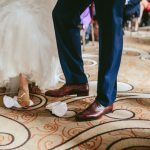 Having attended a handful of Jewish weddings, it has proven to be the best way to involve all your guests and get everyone up on the dance floor. It is so fun to witness the bride and groom being lifted in a chair by their loved ones. Now that it is our to be in the chair, I am a bit more apprehensive to the tradition simply for the fact of falling off! However, I know that I would regret it immensely if we skipped it all together, so I will have to muster up the courage (or have a couple cocktails) before being hoisted up in the air. We know all of our friends are especially excited for this part of the night! One Catholic tradition that has always been important to me is having my dad walk me down the aisle. In Jewish tradition it is customary for both the mother and father to walk the bride down the aisle. And while both my parents have taught me so much about love, respect, and relationships, my dad is the one who showed me the qualities I wanted in a partner. Colin possesses all the best qualities that I love about my dad. They both remind me to not take life so seriously, they are the ones I go to when I’m in a panic and need a calm voice of reason, and the ones who inspire me to be the best version of myself. Having my dad be the one to walk me to Colin is something I have looked forward to for a very long time. 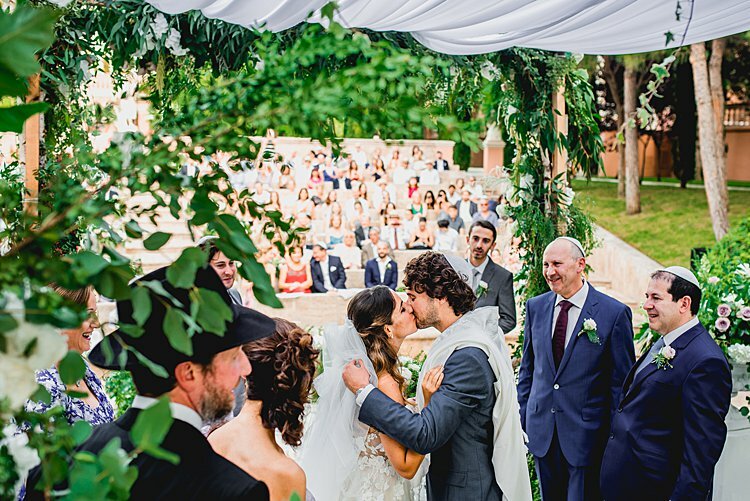 It is not only customary in the Jewish faith for the mother and father to walk the bride down the aisle; it is tradition that they stand under the chuppah as well. In the Catholic faith, the bridal party stands by the bride and grooms side. Our bridal party is on the smaller side and only includes our siblings: my sister, my brother, and Colin’s two brother, as well as my two best friends, one of which I have known since birth and the other since the first grade. They have supported us for all 11 years of our relationship, and been with us for every step of this wedding planning process. 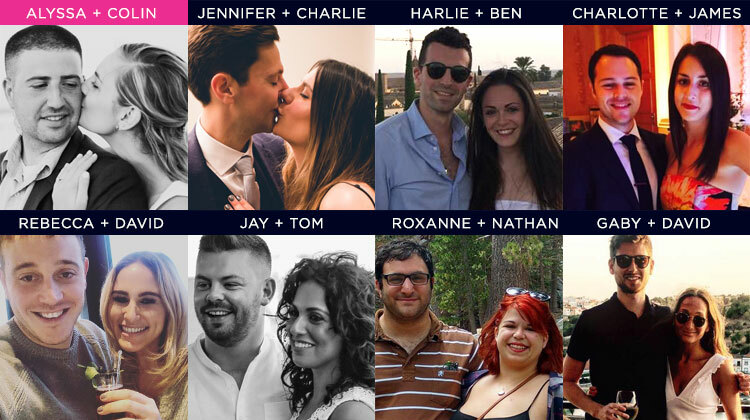 It seems only fitting that they be the ones to stand by our side on the big day. The Rabbi suggested that because the chuppah represents our future home together as a married couple they do not stand directly underneath it. This will be the perfect way to symbolize us becoming our own family while still having our support system close by when we need them. Although Colin is the Jewish one in the relationship, ironically I am the one with a Bubbie. My grandmother lovingly got the name Bubbie from my sister when she was just a baby. When my sister was sick with a cold my grandmother brought over her cure-all specialty, fries and a milkshake, which prompted my sister to shout “Oh Bubbie” and the name stuck ever since. Years later we found out that Bubbie is in fact the Jewish term for grandmother. My Bubbie is a remarkable woman who is kind and nurturing and all the things you wish a grandmother would be. She is a main reason why my extended family is and remains so close. For almost every family function she has crafted a poem or blessing about the occasion to read aloud as sort of a prelude to the event. It is always heartfelt and sincere and always brings my family to tears. It is important to us that Bubbie begin our most special event with a blessing just as she has done for all our favorite family moments. 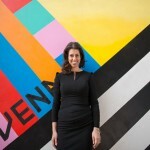 Click here to read all Alyssa’s planning posts to date.